The Controlled Substances Act (CSA) was passed by Congress as Title II of the Comprehensive Drug Abuse Prevention and Control Act of 1970. And signed into law by President Richard Nixon on October 27, 1970. Since the passage of the Harrison Narcotics Tax Act in 1914 many attempts had been made to strengthen government control and regulation of illicit substances with varying degrees of success. The Comprehensive Drug Abuse Prevention and Control Act is our countries most ambitious attempt to date and replaces similar legislation from the past including the Harrison Narcotics Tax Act. The Comprehensive Drug Abuse Prevention and Control Act provides for the classification, acquisition, distribution, registration/verification of prescribers, and appropriate record keeping requirements of controlled substances. This act also provided the legal framework for the creation of the Drug Enforcement Administration (DEA), which is the organization primarily tasked with the enforcement responsibilities of the CSA. To ensure an appropriate understanding of this law various updates will be included with discussion of this act. Besides over the counter medications (OTC) such as aspirin and ibuprofen, behind the counter medications (BTC) such as Allegra-D (fexofenadine with pseudoephedrine), and prescription medications (Rx legend) such as amoxicillin and digoxin, there is another group of medications to be concerned with called controlled substances. Controlled substances are medications with further restrictions due to abuse potential. There are 5 schedules of controlled substances with various prescribing guidelines based on abuse potential counter balanced by potential medicinal benefit as determined by the Drug Enforcement Administration and individual state legislative branches. The DEA is provided with this authority by the Controlled Substances Act. Below is a brief explanation of the schedules along with example medications. Not available by a prescription. High potential for abuse or misuse. Sufficient medicinal use to justify availability as a prescription. Potential risk for abuse, misuse, and dependence. Codeine when combined with acetaminophen or a cough suppressant in a solid dosage form (tablet, capsule, etc.). Low potential for abuse and limited risk of dependence. Low potential for abuse or misuse. Cough medicines that contain a limited amount of codeine. Antidiarrheal medications that contain a limited amount of an opiate such as Lomotil (diphenoxylate and atropine). Many problems associated with drug abuse are the result of legitimately-manufactured controlled substances being diverted from their lawful purpose into the illicit drug traffic. Many of the narcotics, depressants and stimulants manufactured for legitimate medical use are subject to abuse, and have therefore been brought under legal control. The goal of controls is to ensure that these "controlled substances" are readily available for medical use, while preventing their distribution for illicit sale and abuse. Controlled substances require special consideration when it comes to purchasing. Schedule III – V drugs may be ordered by a pharmacy or other appropriate dispensary on a general order from a wholesaler and you should check the delivery in against the original order. 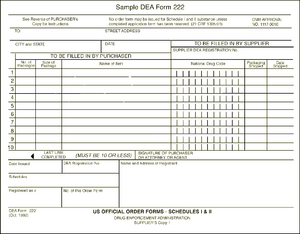 The DEA form 222 is a triplicate form. The pharmacy retains the third sheet while sending the first and second pages to the wholesaler. The wholesaler is responsible for sending the second page to the DEA while retaining the first page for its own records. When the Schedule II medications arrive in the pharmacy they should be checked in against the DEA form. An individual enrolls with the DEA and, once approved, is issued a personal CSOS Certificate. The purchaser creates an electronic 222 order using an approved ordering software. 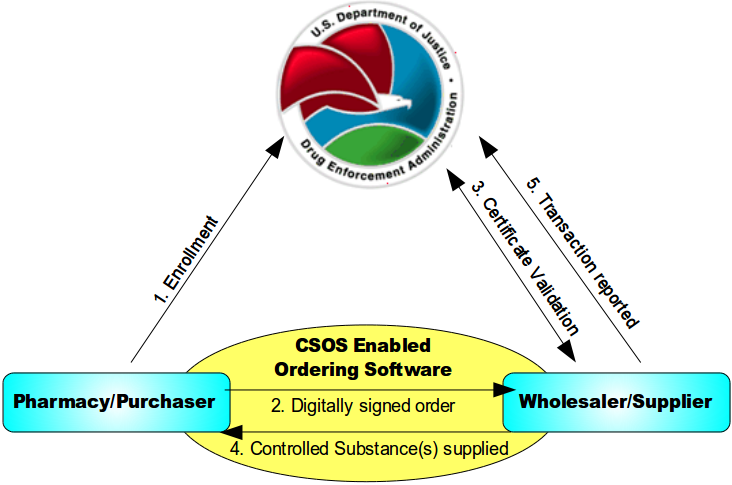 The order is digitally signed using the purchaser's personal CSOS Certificate and then transmitted to the suppliers. The paper 222 is not required for electronic ordering. The supplier receives the purchase order and verifies that the purchaser's certificate is valid with the DEA. Additionally, the supplier validates the electronic order information just like it would a paper order. The supplier completes the order and ships to the purchaser. Any communications regarding the order are sent electronically. The order is reported by the supplier to the DEA within two business days. When the pharmacy receives controlled substances they should be carefully checked in against the purchase order including product name, quantity, strength, and package size. Controlled substances are shipped in separate containers from the rest of the pharmacy order and should be checked in by a pharmacist, although pharmacy technicians may assist with this process under the direct supervision of a pharmacist. Schedule II medications need to be checked in against your DEA 222 form (whether the paper triplicate form, or the electronic form on your CSOS enabled software). Schedule II medications may be stocked separately in a secure place or disbursed throughout the stock. Their stock must be continually monitored and documented. Dispersed throughout the pharmacy stock. By dispersing the stock through out, you effectively prevent someone from being able to obtain all your controlled substances since they can not do easy "One stop shopping." Controlled substances have some additional things to keep in mind when reviewing prescription orders. All controlled substance prescriptions require the prescriber to include their DEA number on the prescription. While traditional prescriptions are good for one year from the date they are written and (at the prescriber's discretion) may have a sufficient number of refills to cover an entire one year supply; controlled substances have some differences based on which schedule they are. Schedule V medications may be refilled for up to a one year supply like prescriptions for non-controlled substances. Schedule III-IV medications may be written for up to a six month supply of medications including any refills on the original prescription. Schedule II medications may be written for up to a 90 day supply but may not include any refills. If a patient has a 30 day limit from their insurance the physician would need to write three separate prescriptions for thirty days to cover the full 90 days. Prescribers are not allowed to exceed a 90 day supply of a schedule II medications with out seeing the patient again. Pharmacies may accept telephone orders and faxes for schedule III-V medications. The pharmacist must immediatley reduce telephone order prescriptions to writing. Schedule II medications may not be ordered over the phone or via a fax machine under ordinary circumstances. A practitioner prescribing Schedule II narcotic controlled substances to be compounded for the direct administration to a patient by parenteral, intravenous, intramuscular, subcutaneous or intraspinal infusion may transmit the prescription by facsimile. The pharmacy will consider the facsimile prescription a "written prescription" andno further prescription verification is required.All normal requirements of a legal prescription must be followed. Practitioners prescribing Schedule II controlled substances for residents of Long Term Care Facilities (LTCF) may transmit a prescription by facsimile to the dispensing pharmacy. The practitioner’s agent may also transmit the prescription to the pharmacy. The facsimile prescription serves as the original written prescription for the pharmacy. A practitioner prescribing a Schedule II narcotic controlled substance for a patient enrolled in a hospice care program certified and/or paid for by Medicare under Title XVIII or a hospice program which is licensed by the state may transmit a prescription to the dispensing pharmacy by facsimile. The practitioner or the practitioner’s agent may transmit the prescription to the pharmacy. The practitioner or agent will note on the prescription that it is for a hospice patient. The facsimile serves as the original written prescription. Provision of a written prescription to the pharmacist prior to dispensing is not reasonably possible for the prescribing physician. In an emergency, a practitioner may call-in a prescription for a Schedule II controlled substance by telephone to the pharmacy, and the pharmacist may dispense the prescription provided that the quantity prescribed and dispensed is limited to the amount adequate to treat the patient during the emergency period. The prescribing practitioner must provide a written and signed prescription to the pharmacist within seven days. Further, the pharmacist must notify DEA if the prescription is not received. The regulations concerning electronic transmission of controlled substances via e-prescribing recently changed. As of June 1, 2010 physicians and pharmacies are now allowed to transmit prescriptions for Schedule II, III, IV, and V medications as long as they are using properly certified software (i.e., SureScripts). While this is a recent shift in federal law, some states may still prohibit e-prescribing for controlled substances. Pharmacists often question the DEA rule regarding the partial refilling of Schedule III, IV, or V prescriptions. Confusion lies in whether or not a partial fill or refill is considered one fill or refill, or if the prescription can be dispensed any number of times until the total quantity prescribed is met or 6 months has passed. According to the DEA's interpretation, as long as the total quantity dispensed meets with the total quantity prescribed with the refills, and they are dispensed within the 6-month period, the number of refills is irrelevant. The total quantity dispensed in all partial fillings does not exceed the total quantity prescribed. No dispensing occurs 6 months after the date on which the prescription was issued for schedule III and IV medications or 12 months after the date on which the prescription was issued for schedule V medications. For a Schedule II drug, the pharmacist may partially dispense a prescription if he or she is unable to supply the full quantity in a written or emergency oral prescription, provided the pharmacist notes the quantity supplied on the front of the prescription. The remaining portion must be supplied within 72 hours of the first partial dispensing. Otherwise, the pharmacist is obligated to notify the prescribing physician of the shortage. The DEA allows the transfer of original prescription information for Schedule III, IV, and V controlled substances for the purpose of refill dispensing between pharmacies on a one-time basis. Pharmacies which electronically share a real-time, online database may transfer up to the maximum number of refills permitted by the law and authorized by the prescriber. In either type of transfer, specific information must be recorded by both the transferring and the receiving pharmacist. The DEA does not allow for the transfer of Schedule II controlled substances, as they do not allow refills on these medications and partial fills, as discussed above, have strict limitations. Under federal law, all businesses which manufacture or distribute controlled drugs, all health professionals entitled to dispense, administer or prescribe them, and all pharmacies entitled to fill prescriptions must register with the DEA. Authorized registrants receive a "DEA number". Registrants must comply with a series of regulatory requirements relating to drug security, records accountability, and adherence to standards. A DEA number is a series of numbers assigned to a health care provider (such as a dentist, physician, nurse practitioner, or physician assistant) allowing them to write prescriptions for controlled substances. Legally the DEA number is solely to be used for tracking controlled substances. The DEA number, however, is often used by the industry as a general "prescriber" number that is a unique identifier for anyone who can prescribe medication. This is a short video demonstrating how to validate a physician's DEA number. Every pharmacy must maintain complete and accurate records on a current basis for each controlled substance purchased, received, distributed, dispensed, or otherwise disposed of. These records must be maintained for 2 years. It is also required that records and inventories of Schedule II and Schedule III, IV, and V drugs must be maintained separately from all other records or be in a form that is readily retrievable from other records. The "readily retrievable" requirement means that records kept by automatic data processing systems or other electronic means must be capable of being separated out from all other records in a reasonable time. In addition, some notation, such as a 'C' stamp, an asterisk, red line, or other visually identifiable mark must distinguish controlled substances from other items. A pharmacy is required by the DEA to take an inventory of controlled substances every 2 years (biennially). This inventory must be done on any date that is within 2 years of the previous inventory date. The inventory record must be maintained at the registered location in a readily retrievable manner for at least 2 years for copying and inspection by the Drug Enforcement Administration. An inventory record of all Schedule II controlled substances must be kept separate from those of other controlled substances. Submission of a copy of any inventory record to the DEA is not required unless requested. When taking the inventory of Schedule II controlled substances, an actual physical count must be made. For the inventory of Schedule III, IV, and V controlled substances, an estimate count may be made. If the commercial container holds more than 1000 dosage units and has been opened, however, an actual physical count must be made. fill out and file DEA form 106. The DEA form 106 is available as both a printed form, or may be filed electronically. To obtain the printed form click here and printout the PDF. To file elctronically proceed to https://www.deadiversion.usdoj.gov/webforms/dtlLogin.jsp . The DEA requires that theft of controlled substances must be reported within 24 hours. Some states have made additional drugs scheduled medications such as Arkansas and Kentucky have made tramadol a controlled substance. Many states, such as Pennsylvania, treat schedule V prescriptions the same as schedule III and IV prescriptions with regards to refill limits and totally quantity that may be prescribed at a time. Various states, such as New York, limit schedule II prescriptions to a 30 day supply. Some states, such as Hawaii and Montana, currently do not allow e-prescribing of controlled substances. Be aware of the differences with regards to controlled substances in the states you practice in and remember that the expectation when state and federal law appear to be in conflict is that you will follow the stricter regulation. This page was last modified on 10 February 2015, at 08:46. This page has been accessed 23,442 times.